This morning I went to St. Peter and St. Paul in Muchelney (near Langport, Somerset) for the first time since the concert I gave there in March. I was asked back to sing at their team service, where all the churches in the parish worship together. It was an honour to be asked back and lovely to see so many familiar faces again! The theme for the service was the Way of St. James, or El Camino de Santiago – the pilgrimage walked by thousands of people a year. Funnily enough, I’d had a conversation with someone on the bus to Taizé about the film called The Waywith Martin Sheen, which is about the road to Santiago, and when I’d got home I ordered the DVD as it wasn’t the first time I’d heard good things about the film. But the film had just been sitting there, waiting to be watched, until I got a call from the priest at Muchelney asking me to sing and explaining that three of the parishioners had recently returned from walking the Way. The time had come to watch The Way, and it was well worth waiting for. If you haven’t seen it, do! It’s an incredibly beautiful and moving film. Anyway, so the service today was about this pilgrimage (which I now want to do!). And I think it is the first church service I’ve been in for…years, if ever…that I have felt the power of God so tangibly. There were photographs shown from the pilgrimage undertaken by the three parishioners, who had travelled with a group from the Diocese. There were also stories and reflections, prayers and songs. I felt really moved to have been asked to sing many of the songs during the service. I can’t help but think about the significance behind this act of laying down burdens. 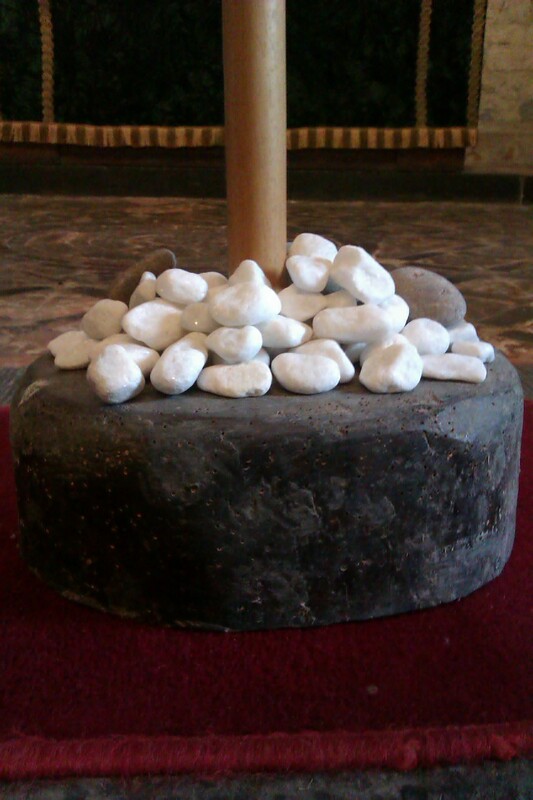 I remembered a Good Friday service where the congregation was asked to come forward and lay a nail down at the foot of the cross, to reflect on the closeness of the crucifixion, and this stuck me as just as powerful as that experience had been. We carry around so much unnecessary baggage and so often we ignore what we are holding onto – perhaps because someone we know is suffering and we consider their burden greater than ours, or perhaps because we find it difficult to face the difficulties we experience. It was a great blessing to share in the experience of the pilgrims this morning. The question I am left with now is: will I walk? And the answer may well be yes! I’m sorry to say that this has passed me by until now, but I’ve been doing some reading and find it an interesting idea. There are festival days for the cross on which Jesus was crucified throughout the year – 13th/14th September, 12th October, 6th March, 3rd May and 1st August as well, of course, Good Friday. In the Orthodox tradition, every Wednesday and Friday hold commemorations of the cross. I saw an interesting comment on an article recently, where someone said that Christianity didn’t begin and salvation didn’t start until Jesus resurrected. I thought it was an interesting take but wasn’t convinced. I have always thought of the resurrection and ascension as an affirmation of the divinity of Jesus, a way to reinforce the belief in him as the Messiah (fulfilment of prophecy etc.) but of the crucifixion as the more significant act. I couldn’t quite get my head around the comment that suggested it was less important than the resurrection. If I feel like I need to reconnect with God on an emotional level, I will read the Passion in the Bible or watch a film like ‘Mary, Mother of God’ or ‘The Passion of the Christ’. Seeing the pain that Jesus suffered is often such an overwhelming experience that it engenders deep love and humility, even if just for a little while. So, at this point in the year, a long time since/to Easter, stop and think of the cross. What an amazing display of unconditional love. If only we could learn to do the same. The offering I would like to make to you today is the title track from my second album, ‘Can You Hear My Heart?’, which tells the story of the crucifixion from the perspective of a disciple watching on in despair. 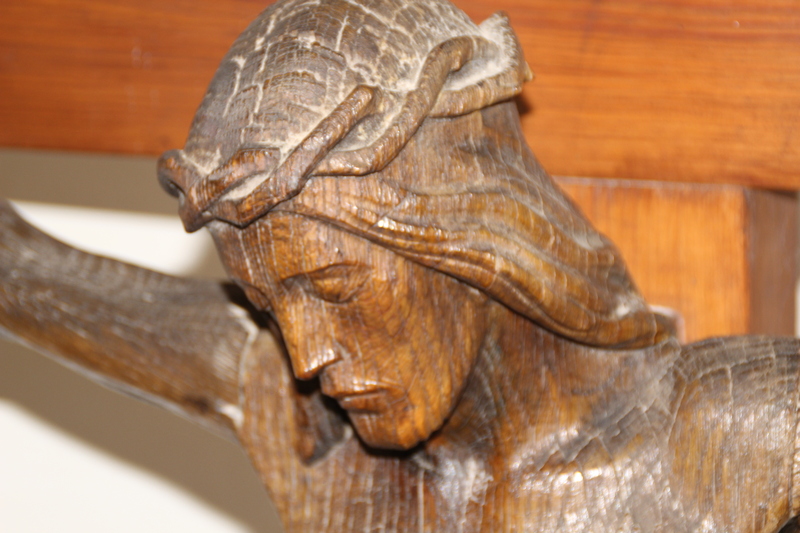 The question, repeated again and again, is a plea for comfort from the crucified Jesus. And at the end, the answer is given. Copyright © http://kathryncrosweller.com 2012 - 2019 all rights reserved.